Quickly enter goals from an 8 figure grid and more. The Waypoint tool streamlines a number of functions when working with 8 figure grid references. To view the data on one of your waypoints click the select button and then click on the Waypoint on your map. The data fields will fill out as shown. If elevation data is available on your map or in the Waypoint list then you will get that information. The map datum is shown as a check that your settings are correct. Always make sure you are aware of the map datum in use for the competition so you are declaring goals in the correct location. If this datum information does not match the required map datum for the competition you will need to adjust the map settings inside Oziexplorer. The move function gives you the ability to round the location of a Waypoint to a full number and also to nudge a Waypoint along an easting or northing value. With logger scoring of any task where you can enter an 8 figure grid reference for a goal you are setting the goal with a resolution of 10 meters. When you pick a point on your electronic map (drop a Waypoint) you are setting that location to a resolution of maybe 0.1 of a meter. 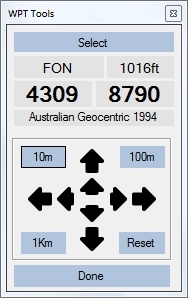 Depending on how you read your co-ordinates from the map this could put the Waypoint you are navigating to almost 10m away from the one you declare in the logger. Rounding: Lets look at an example. Say I have decided to pick a FON goal at track I can see on the map so I have a visual guide for the approach. I mouse over the point on the map and make a Waypoint. I then select that Waypoint using the Waypoint tool to get the 8 figure reference so I can declare it in the logger. The Waypoint tool shows you the rounded grid coordinate but this is slightly different to the actual Waypoint you are navigating to in Oziexplorer. When you look at the two full sets of grids it should make sense. The Waypoint you have actually picked on the map is 55H 643086 6287905 but you are declaring a goal at 55H 643090 6287900. This is actually a difference of 6.4m between the Waypoint you are flying to and the goal you have declared. The problem is that as I approach the Waypoint my distance to goal will include the 6.4m error. If you fly the perfect approach to the Waypoint and hit MARK right on 0m you will actually score 6.4m which is really just giving away points for no good reason. In the move section of the tool there are buttons for 10m, 100m and 1km. Each of these will round and move the Waypoint accordingly. In most cases the 10m button is the one you want. It will adjust the location of your Waypoint to match the rounded 8 figure grid reference as shown. To be clear, clicking the 10m button will move the Waypoint on your map but will not adjust the co-ordinates you see for the goal. You now have a perfect sync between the goal you have declared and the goal you are navigating to. It may just save you a few meters on a result. Why does it not do this automatically? There are plenty of times when you don't want waypoints being moved without you choosing to actually do so. For example, if you were displaying the details for a Waypoint from a goal list you would not want it to be automatically rounded and moved. Often directors will require you to set a goal or a 3DT on a particular easting or northing. This is where rounding to the nearest 10mm or 1km comes in handy. With these rounding buttons you can roughly place your Waypoint on the map and then quickly round it to the easting or northing you need. 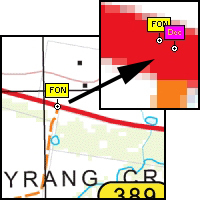 In combination with then nudge arrows this is a very fast way of accurately positioning a Waypoint. In the middle of the move panel you have eight arrows for pushing your Waypoint around the map. The smaller, inner arrows will move your Waypoint 10m along the easting or northing while the larger arrows will move the Waypoint by 100m. As mentioned above this is very useful when you have to position a goal or middle of a 3DT on a particular easting or northing as you can just move it back and forth as needed without worrying about precise placement. Obviously you still have access to the tools directly in Oziexplorer to make new waypoints and often that may be the fastest option to quickly drop a Waypoint on the map. The new Waypoint tool in oziTarget however adds some nice features for quickly generating waypoints from a task sheet. With more and more logger competitions we are seeing lists of HWZ goals that often are not in the goal list already. This means manually entering this data or even if they are in the goal list, often you get target co-ordinates that are different to the goal, again meaning manual entry is required. This is where the Waypoint tool can speed things up. From the first page of the Waypoint tool, select NEW to open the tools for making new waypoints. The next two fields are the EASTING and NORTHING in 8 figure format. If required, you can set the MMA distance in meters. This will use the proximity distance setting for a Waypoint to draw the MMA ring. If you want the map to center on the new Waypoint, check the CTR on NEW check box. If you want to use the Oziexplorer default display style for the new Waypoint, check the DEFAULT check box. 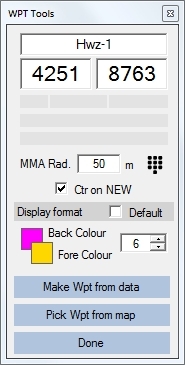 Alternately, you can set the colours and font size for the new Waypoint - helpful if you want to set the goal colours to match the marker colours for example. 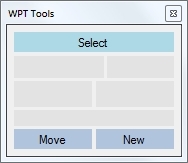 Finally, select MAKE WPT FROM DATA and then click in the correct area of the map. What is the correct area? read more here..